As thousands of runners have their sights set on Boston, I am thinking about socks. Have you ever been on a run, or a few minutes into a workout, only to feel your sock slipping under your heel or bunching under your toes and your workout takes a toll? Well I've been there. 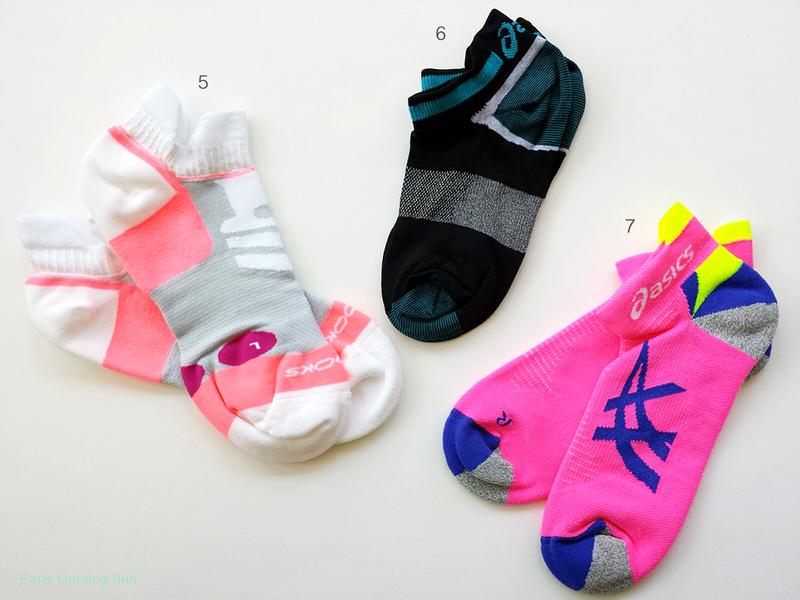 So I recently set out on a quest to find some great running socks that won't get in our way as we push towards reaching our goals. 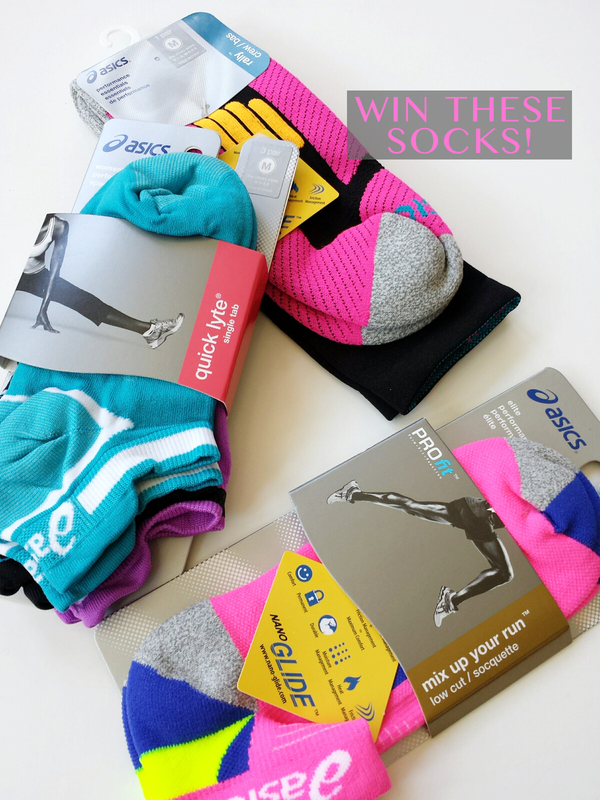 A few awesome brands - Asics, Balega, Bombas, Brooks, Feetures! - pitched in to help me out. I was somewhat surprised to find that I liked all of these styles, but for different reasons. 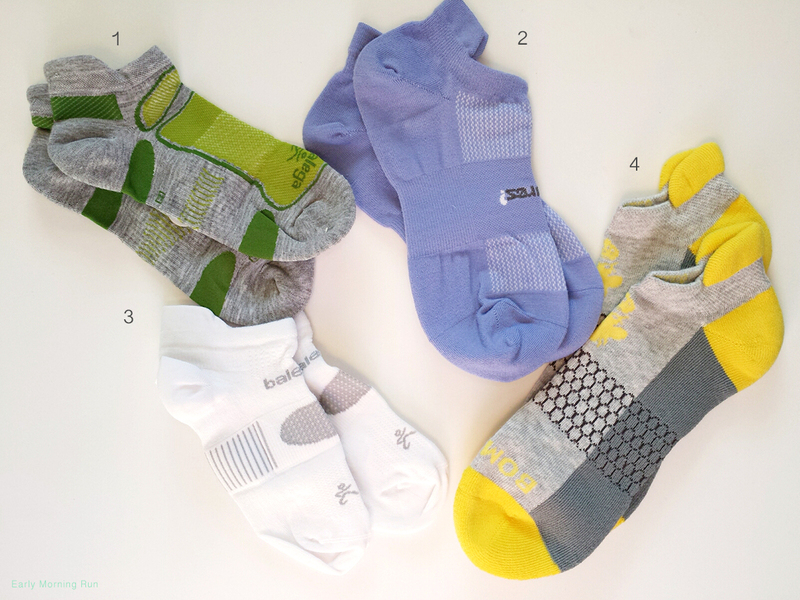 Some are super-thin, ultra light weight perfect for a hot day, some are in between and others provided a good bit of cushioning and were better for those chilly Spring runs. Because of this, I decided the best way to break it down for you is based on the amount of cushioning. After all, the shoes we're wearing and the weather have a lot to do with the socks we choose. 6. Asics: Quick Lyte Single Tab come in packs of three and will not weigh you down! Good news for you... Asics sent me extras so I'm sharing the love! Happy feet make a happy runner, am I right? 4. Brag a little: What recent running or fitness related accomplishment are you most proud of? 5. Sound off: What races do you have on your schedule? I'm proud of my recent good showing in a 5k - my first of the season. Next up is a 5 mile race and a half marathon after that. I posted a tweet: https://twitter.com/FireRunner2379/status/590113677082238976. After a couple of years of trying I finally was able to qualify for the NYC marathon and got accepted this year. I turn 40 in May on a Friday and am running the Horse Capital Marathon in Lexington, KY on Saturday followed by the Cleveland Marathon on Sunday. It should be an epic weekend! I just completed my 3rd full with a PR ...AND I was wearing the Balega Second Skin Fit: Ultralight Socks. :) We had mile 14-26 in the rain but we still PR'd! Running 4-5 days a week while abroad is definitely something I'm proud of! The only official race on my schedule is the Prairie Dog Half Marathon in Westminster in September!! (Although I plan to do a 5K with my mom early this summer:) ) great blog, Lisa!!! I heart socks and totally get the importance. Asics are my personal fave! I want to run in the Cooper Bridge Run next year. I can stay on the stairmill for an hour with no breaks now, not much of an accomplishment, but the best thing I've done lately. I had twins in Nov and just started back after a year off and it was a tough year physically. I feel way discouraged at how long it's going to take me to get back in shape and I'm proud of myself for forcing myself back on the road. I am proud of increasing my mileage. I had been stuck at 3 miles for a while and am up to 4 this week. Three times a week is pretty good for my busy life. I have a 10K on the schedule for June. I am most proud of being able to run recently without my legs feeling like million lb. weights immediately and thereby increasing my endurance and distance. I started running and still kept my pace and distance over the winter!! Yay!! I recently had to quit running because of medical but now I want to get on the road again to running. These socks look good inspiration to me! I run for my daughter who had cancer from when she was two months old. She is a survivor and my inspiration to a health life! Hi Jasanna, Yes, winners were chosen and posted on Monday. Christy Runs and Sadie B were the winners. Thanks for entering!